In this paper we analyze judgement aggregation problems in which a group of agents independently votes on a set of complex propositions that has some interdependency constraint between them (e.g., transitivity when describing preferences). We consider the issue of judgement aggregation from the perspective of approximation. That is, we generalize the previous results by studying approximate judgement aggregation. We relax the main two constraints assumed in the current literature, Consistency and Independence and consider mechanisms that only approximately satisfy these constraints, that is, satisfy them up to a small portion of the inputs. The main question we raise is whether the relaxation of these notions significantly alters the class of satisfying aggregation mechanisms. The recent works for preference aggregation of Kalai, Mossel, and Keller fit into this framework. The main result of this paper is that, as in the case of preference aggregation, in the case of a subclass of a natural class of aggregation problems termed ‘truth-functional agendas’, the set of satisfying aggregation mechanisms does not extend non-trivially when relaxing the constraints. Our proof techniques involve boolean Fourier transform and analysis of voter influences for voting protocols. The question we raise for Approximate Aggregation can be stated in terms of Property Testing. For instance, as a corollary from our result we get a generalization of the classic result for property testing of linearity of boolean functions. The research was supported by a grant from the Israeli Science Foundation (ISF) and by the Google Inter-university center for Electronic Markets and Auctions. 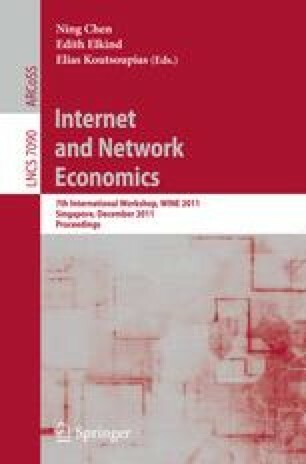 Previous versions of this work were presented at Bertinoro Workshop on Frontiers in Mechanism Design 2010, Third International Workshop on Computational Social Choice, Düsseldorf 2010, and Computation and Economics Seminar at the Hebrew University. The author would like to thank the participants in these workshops for their comments. Due to space constraint the proofs of all theorems are omitted as well as some discussion on the implications of this work to other fields. The long version of this paper can be found on the author website.